Topic: New recruit trying to log every cache in Ireland in one day! Is it OTT and Medic143 playing a joke?? Since Jan 2012. I work in a Accounts Dept in a Menswear shop. here is the Revenue Commissioner website. It doesn't really make any difference on your previous point. dino wrote: Just worked it out. This means we have been "overcharged" by Ã¢â€šÂ¬1.76 per year. Not really worth getting that worked up about to be honest! I had the same problem. I just got a new GPS with all the modern cables... Worth it in the long run. Topic: Suggestions for NI winter walk, venue and date. Re: Suggestions for NI winter walk, venue and date. If you are going to choose Kilbronney, this is the route that I was thinking of on the other forum page. Belfast Hills are equally as good but I don't know of any good routes. 2nd Feb doesn't suit me either. 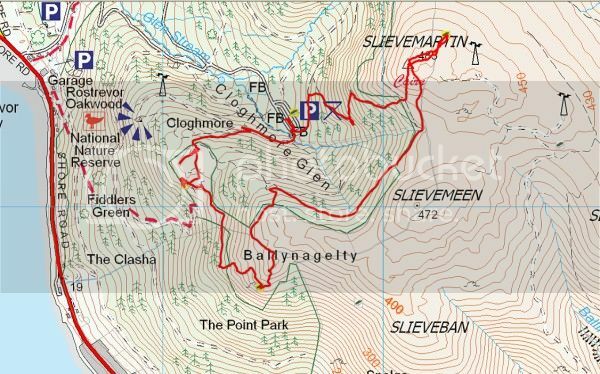 Going on Dino's sugguestion, why not go to Kilbroney Park, drive up to the high Car Park and climb up to Cloghmore and continue on to Slieve Martin and then down the track back to the same car park. You would still appropriate gear for the walk. Topic: Maps on the GC site not showing description or call out? Re: Maps on the GC site not showing description or call out? Yes, I have had this problem. I just click once on the cache box and it usually works.